What a hit! This little number went down a treat at my mother and auntie’s birthday party last weekend. It has multiple kinds of chocolate included so I named it Death By Chocolate (how creative of me). Be warned though, it can be quite hilarious to cut and serve, but worked out fine. Feel free to contact me if you would like anything made! Ferrero Rochers (enough to go around the top) I used 8. Step 2. Sift 1/2 flour over egg mixture and using a large metal spoon or rubber spatula, fold in until combined, taking care not to lose volume. Fold in the other half with the cocoa powder, baking powder and vanilla extract. Pour into tin. Step 3. Bake for approximately 30-35 mins, or until the cake skewer comes out clean. Cool in tin for 5 mins, then turn out onto a wire rack and peel away the paper. Leave to cool completely. Step 4. Turn the cake upside down and slice horizontally creating your two layers. Repeat these 4 steps if you would like to create a 4 layered cake as I did. Step 5. Beat butter until pale and creamy, about 2 minutes. Add the cream cheese, icing sugar, chocolate hazelnut spread and salt and beat until smooth and fluffy. Step 6. It is best to start assembly at this stage. Place the first cake layer on a plate and spread a layer off hazelnut filling on top. (If you have more than 2 layers, repeat this step for each, leaving the top of the cake. No need to spread it al the way to the edges as the weight of the cakes will cause it to spread. Step 7. Take a knife and with the remaining hazelnut icing, spread it around the cake. I prefer to have parts of the sponge peeking through but you can use as much as you like. I left a little for underneath the Ferrero Rochers too. Step 8. Coarsely chop the dark chocolate and place it in a saucepan together with butter, over low heat. Stir often until everything is melted. Add a pinch of salt. Let it cool for approximately 5 minutes (don’t let it thicken too much) and then pour over the top and quickly spread parts over the edges so it runs down the sides. Step 9. 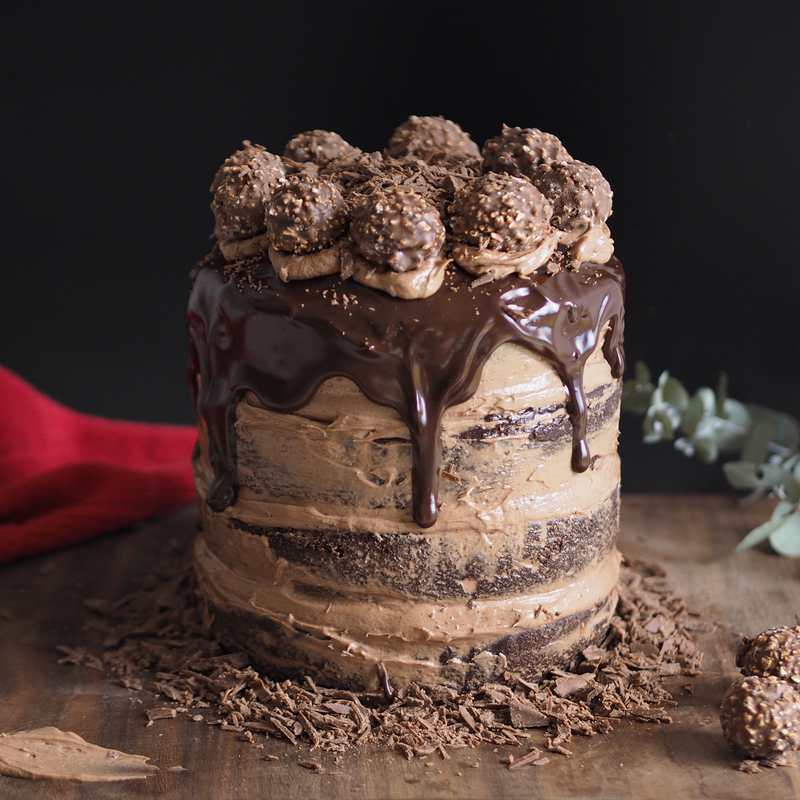 With the remaining hazelnut icing, place small blobs using a teaspoon on the top of the cake and push down with a Ferrero Rocher on each. Step 10. Thinly chop the milk chocolate into flakes and place these around the base of the cake and on top in the centre of the Ferrero Rochers.